Yesterday I returned from Cape Three Points. While I was there, I visited the palace. 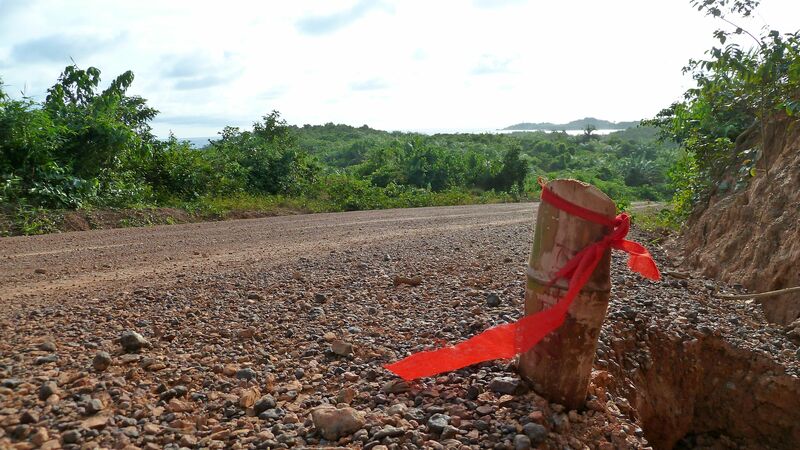 After greeting the chief, I asked him about the survey markers that I had seen on the road leading to the village. The information that he had been given is that a coastal road, first conceived by Dr. Kwame Nkrumah and stretching from Dixcove all the way to Jewi Wharf, will be constructed by a Chinese contractor. I snapped one of the surveyors on my return – see the next photo. I was subsequently told that a Korean contractor has been given the job. I wonder what the real situation is? Stay tuned – I hope to meet with the Ahanta West District Chief Executive to see if he can shed some light on the situation. Several questions run through my mind. Considering the multitude of lagoons that mark this stretch of coastline, what is the projected costs, both financial and environmental, of such a proposed road? Anyone who is familiar with this part of the country will ask the same question. Who is funding this project? What is the real purpose of such a road? What is the time frame? How does this relate to the 2012 election? 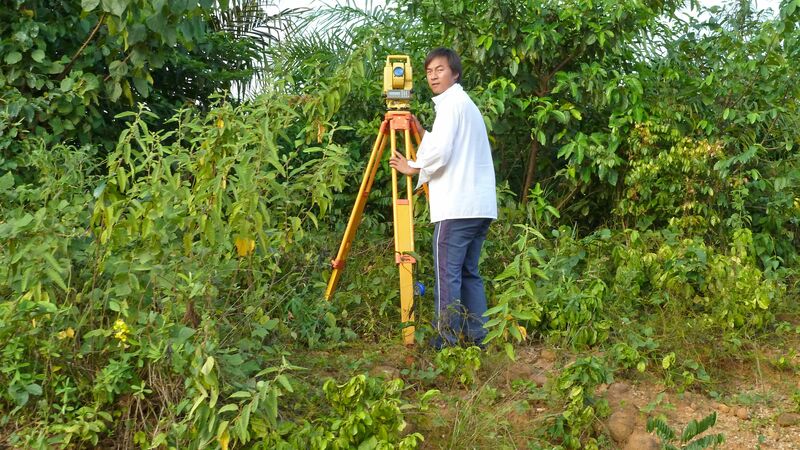 This surveyor was spotted working on the road between Akwadae and Cape Three Points yesterday. It is so ironical that non-citizen Nana is super citizen! Where are Ghanaian citizens when it comes to scrutinizing foreign intervention on their land. Good investigative work Nana….something seems amiss! In reply to Chris Scott, the Ghanaian media are constantly reporting such abuses, Also please check http://savingghana.blogspot.com/. There are also many more that I can mention. We are sometimes too quick to judge ourselves.